Said to have belonged to Comtesse Batowska (city unknown). Charles J. Wertheimer [1842-1911], London. (Duveen Brothers, Inc., London, New York, and Paris); purchased 28 October 1911 by Peter A. B. Widener, Elkins Park, Pennsylvania, probably as Italian sixteenth century (Benvenuto Cellini); inheritance from the Estate of Peter A. B. Widener by gift through power of appointment of Joseph E. Widener, Elkins Park, 1942. The necklace has table-cut stones with rectangular box settings; the settings of the smaller stones are soldered on. There has been some enamel loss. The large chain links are composed of two parts mounted over one another. The sphinx is screwed to the back grid frame and to the console, which is attached to the grid. The parts of the surface which are not enameled are either punch tooled or lined. Modern screws are used. Inventory of the Objects d'Art at Lynnewood Hall, Elkins Park, Pennsylvania, The Estate of the Late P.A.B. Widener. Philadelphia, 1935: 46-47. Works of Art from the Widener Collection. Foreword by David Finley and John Walker. National Gallery of Art, Washington, 1942: 11, as Italian 16th Century (Style of Benvenuto Cellini). Steingräber, Erich. Alter Schmuck. Munich, 1956: 114, fig. 192. English ed. 1957: 113, fig. 192. Walker, John. National Gallery of Art, Washington. New York, 1975: 36, color repro. Hackenbroch, Yvonne. 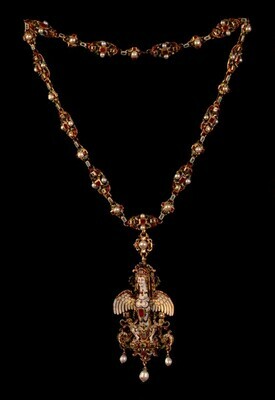 Renaissance Jewellery. London and Munich, 1979: 237-238, no. 637, color pl. 29. Newman, Harold. An Illustrated Dictionary of Jewellery. London, 1981: 287, color pl. 11. Wilson, Carolyn C. Renaissance Small Bronze Sculpture and Associated Decorative Arts at the National Gallery of Art. Washington, 1983: 165-166. Distelberger, Rudolf, Alison Luchs, Philippe Verdier, and Timonthy H. Wilson. Western Decorative Arts, Part I: Medieval, Renaissance, and Historicizing Styles including Metalwork, Enamels, and Ceramics. The Collections of the National Gallery of Art Systematic Catalogue. Washington, D.C., 1993: 303-305, color repro. 303.